A copper mine owned by Minera Panama is being developed in part of Panama’s portion of the Mesoamerican Biological Corridor, which connects wildlife habitat in seven countries of Central America and southern Mexico. Conservationists say forest has been severely affected by mining-caused deforestation that began 10 years ago. Community members say mine development has affected their crops and water supplies. The Environmental Advocacy Center of Panama, an environmental non-governmental organization, alleges that the company operates under an illegal contract. Panama’s Supreme Court of Justice ruled in favor of the Center’s complaint in September 2018. Despite the ruling, construction is continuing and the mine is expected to begin operation in early 2019. Satellite images taken between September 8 and November 24 show recent expansion of deforestation in the mine’s area of influence. From the air one can observe the destruction wrought by an open-pit mining project in Cerro Petaquilla and on the ground people talk about its environmental consequences. 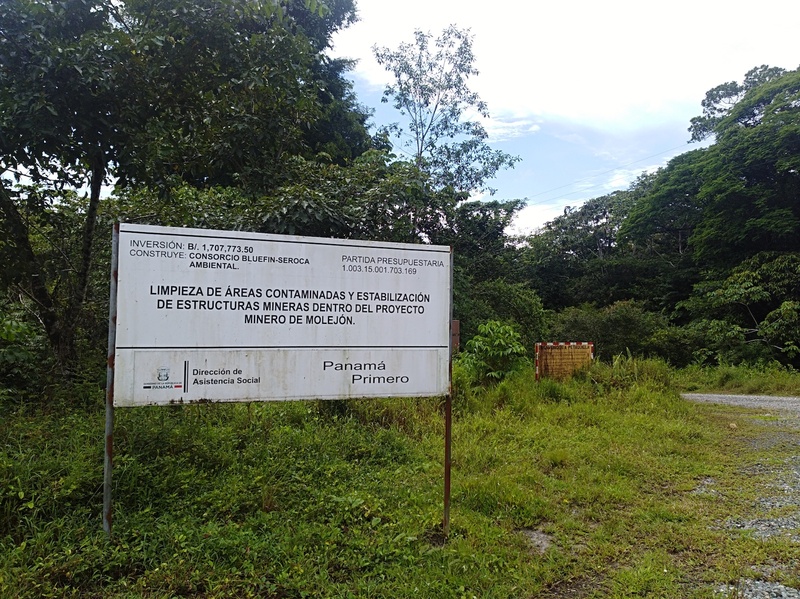 A security checkpoint and a sign announce that you have reached one of the entrances of the project in the area of ​​Molejón, Coclesito, 180 kilometers from Panama’s capital city. The deforestation began with the mining of gold by Panamanian company Petaquilla Gold and has continued with copper mining by Minera Panama, a subsidiary of Canadian company First Quantum Minerals. Deforestation due to the construction of the mining project and access roads. Photo courtesy of CIAM. Petaquilla Gold and Minera Panama are two different companies that share the same goal: the exploitation of metals in that underlay Petaquilla hill. Their activities are governed by a single contract endorsed by the National Assembly (Congress). However, their operations have resulted in the destruction of forest in an area of high regional biodiversity: the Mesoamerican Biological Corridor that connects the seven countries of Central America to southern Mexico. Conservationists say Panama’s portion of the corridor has been severely affected by mining-caused deforestation that began 10 years ago. 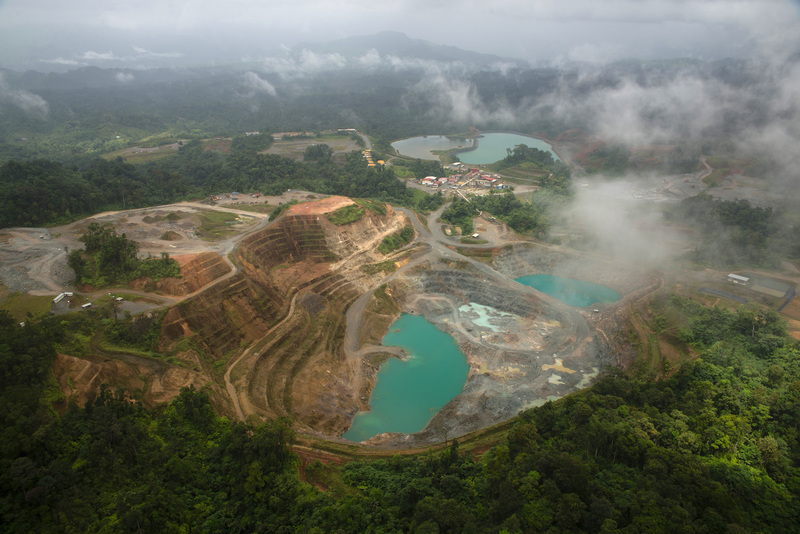 Satellite imagery and data show recent accelerated deforestation caused by mine expansion. The concession, granted by contract law No. 9 of February 25, 1997, covers an area of ​​13,000 hectares that is roughly equivalent to 60 times the size of the Capital District. It is not clear what percentage of this area has been allocated to the copper project developed by Minera Panama. However, in the project’s environmental impact study, the area of impact is specified at 5,900 hectares, of which about 5,500 was covered by lowland tropical rainforest. The remaining areas include 320 hectares that had already been degraded by “anthropogenic activities,” and 25 hectares that correspond to bodies of water. Three important watersheds are within the mine’s area of ​​influence: Petaquilla River, Caimito River and San Juan River. 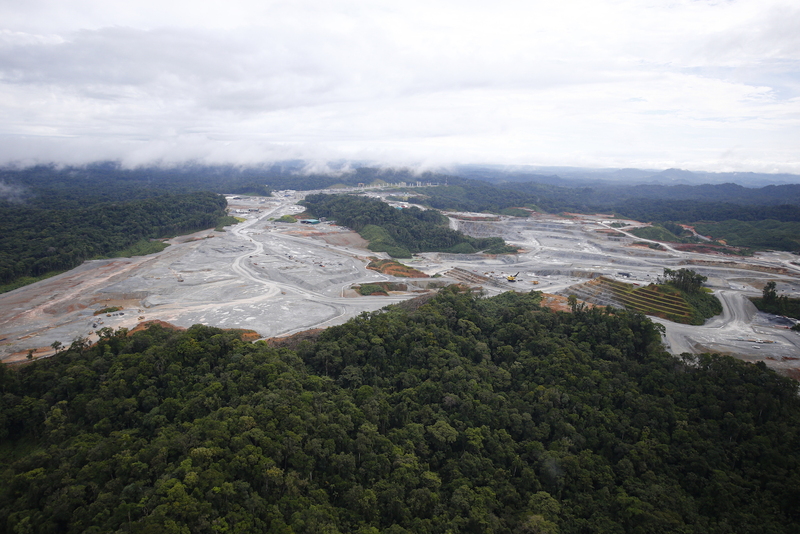 “It has been demonstrated that the clearing activities of the tropical forest could cause changes in local climatic and biological conditions in the forests adjacent to the devastated areas,” states the environmental impact study carried out by Minera Panama, which, unlike Petaquilla Gold, waited for approval of the document by the National Environment Authority (now Ministry of Environment) to start construction work. Minera Panama plans to invest more than $6.3 billion and expects to export around 320,000 metric tons of copper per year. 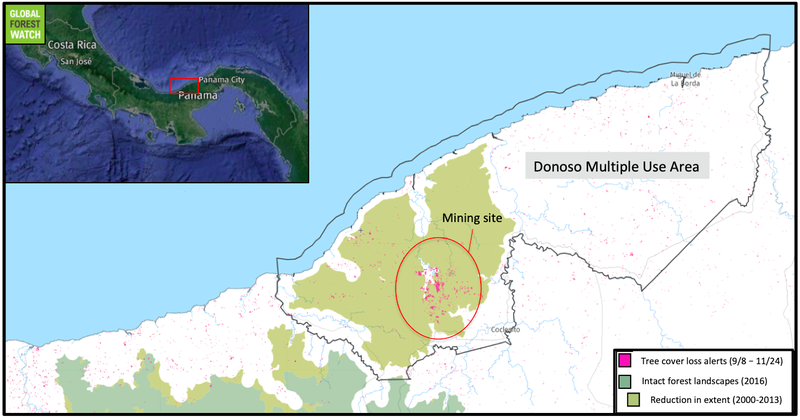 The impact of this mining activity can be seen in satellite images that show what appears to be a consequential loss of primary forest in the area of ​​influence of the project, an area where forest was intact as of 2000. The mine is located in an area of primary forest that remained intact until 2000. Satellite data from the University of Maryland visualized on Global Forest Watch recorded around 4,500 deforestation alerts between September 8 and November 24. Satellite data from the University of Maryland recorded 4,500 deforestation alerts in the area in which the company operates between September 8 and November 24. Satellite images confirm these alerts, showing large areas of clearance. Satellite imagery from Planet Labs shows the progression of deforestation between September and November. Newly cleared areas are highlighted by yellow ovals. To corroborate the imagery and data, a Mongabay team traveled to the area. On Saturday, November 10, the heat was incessant in Coclesito, the humidity was overwhelming, and it drizzled from time to time. Minera Panama is omnipresent in the community: trucks and cars with the company’s logo circulate in both directions through the only two streets of the town, and residents are dressed in work clothes from the mining company. Minera Panama repaired and built the road to Coclesito, and extended it to the mining plant. The entrance is guarded by a private security guard and no one except employees is allowed to enter. One of the entrances to the copper mine. Image courtesy of José Arcia. Although company security prevented entry to the newly deforested area, the Center for Environmental Impact (also known by its acronym in Spanish, CIAM) confirmed that there has been an impact in the area. CIAM is a non-governmental organization that has been following the case for nine years and has made at least three flyovers in the area to document the destruction of the forest. Their last flyover was made eight months ago. In CIAM’s photographs, there is an immense gray void surrounded by green forest. The images also show erosion leaching from denuded areas into neighboring forest. Deforestation began years ago when Petaquilla Gold established a gold mining operation in the area. Image courtesy of CIAM. In 2009, CIAM brought a lawsuit before the Supreme Court of Justice, claiming the contract law was unconstitutional. They argued it did not comply with current regulations that obliged the government to conduct a public tender to grant a mining concession. On September 24, after nine years, the Court ruled in favor of the environmental organization. However, the government allowed Minera Panama to keep building. 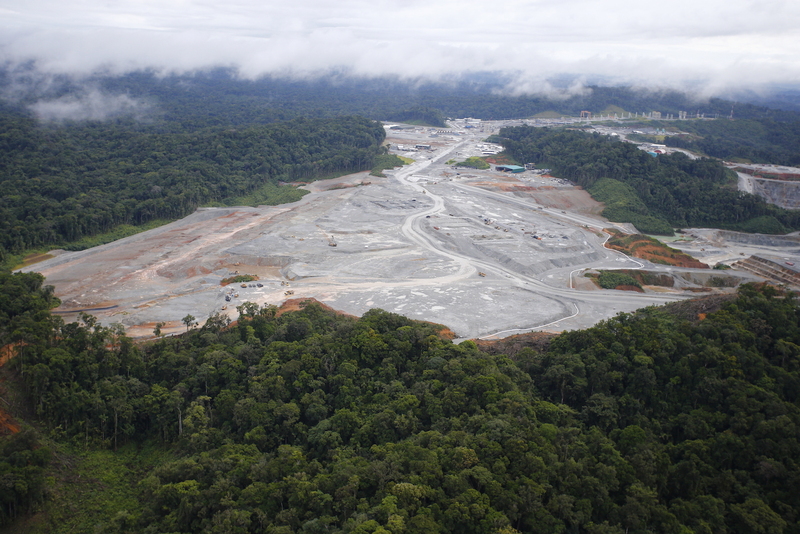 Neither the Ministry of Environment nor Minera Panama responded to Mongabay’s requests for comment. According to the company’s website, the construction phase is 73 percent complete and the mine is expected to begin operations in early 2019. It also states that it has reforested 1,500 hectares of land. Digno Herrera is thin man. His voice rises when he talks about destruction from the mine and the problems he has faced opposing the project. Sitting on the doorstep of his house in Coclesito he says, “mining is incompatible with agriculture and in these rural communities there are only two ways to make a living: working on the land or working for a company.” He says that other than mining, there are no major investments in the area that generate employment – and mining projects usually have an expiration date. “Today, people, especially young people, have an income provided by the company but tomorrow what will they have?” Herrera says. 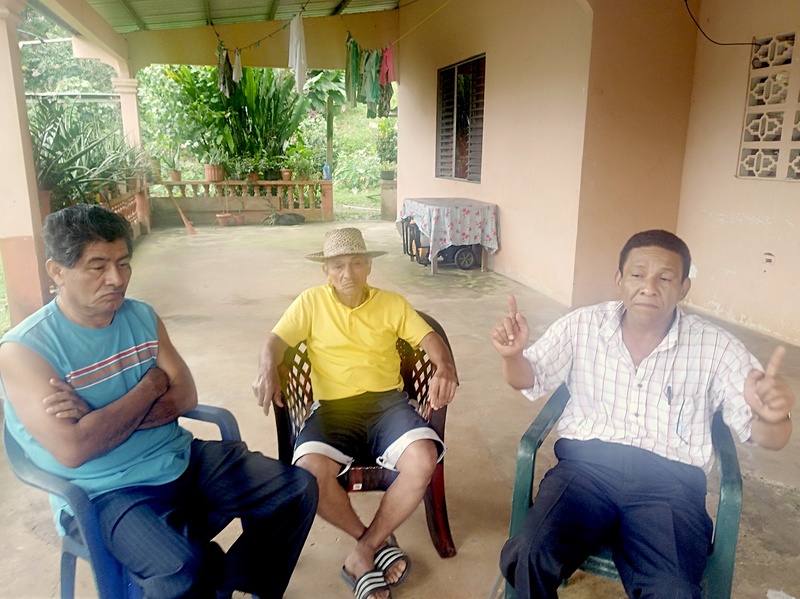 From right to left: Digno Herrera, Germán González and Toribio Valdés, residents of Coclesito who oppose the mining project. Image courtesy of José Arcia. Herrera is one of the founders of the Multiple Services Cooperation, which was created in 2011 to develop a bamboo plantation project and produce other agricultural products while protecting river basins. The initiative has been stymied, however. Although the cooperative managed to plant 10 hectares of bamboo, the local authorities ordered to cut them claiming that the area is part of the mining concession, Herrera said. The issue is in court via a complaint filed by the Cooperative against the authorities. Coclesito used to be known for its coffee and peach palm fruit, locally known as “pixbae” palm. Residents once depended on pixbae for consumption and sale, and also as food for chickens and pigs. But according to Herrera and one of his companions, Estelina Santana, the production of pixbae has drastically decreased since mining activities began in the area. Now, mysteriously, the pixbae palms flourish but they do not develop. Their flowers fall. Santana and Herrera say that community members have also stopped producing coffee and instead have turned to mining. Santana lives in Nuevo San Juan, another community close to the mining project. From her house, you can hear the sound of the San Juan River that she had to stop using due to fear. “We have been told that the river is polluted and we prefer not to use it,” she said. Before the mining started, the communities were supplied with water from the river. But water intakes were subsequently removed to avoid any contact with contamination. Mining-related deforestation in the Mesoamerican Biological Corridor. Image courtesy of CIAM. Santana also notes the problem with pixbae palms. She says that it is inexplicable that after having relying on a massive production of pixbae, she and other residents must now settle for simply seeing the palms bloom. She wonders why this is the case. Isaías Ramos, a biologist with the Environmental Impact Center, says soil studies must be conducted to determine what is happening with the pixbae palms. He also recommends study of potential contamination of the San Juan River. “Maybe nothing is happening to the palms, maybe the chemical substances used in all mining projects have killed the insects that pollinated the palms and since there are no pollinators, the flowers do not bear fruit and they fall,” he says. The biologist calls it a potential “indirect effect” of mining. “In the absence of natural pollinators, [the fruits] are not produced and that may be happening not only to the pixbae palms, but to various species,” he says. According to the mine’s environmental impact study, contamination “may occur as a result of spills and leaks.” However, it does not specify which substances could be spilled. The document also mentions changes in soil organic matter may result from mining activities that could affect the arability of the surrounding land, and recommends recovering the balance of organic matter during the closing and post-closure phases of the project. The impact study found the farming ability of the region could be affected by mining activities. Image courtesy of CIAM. Ramos mentions another environmental issue with the mine: effects on local fauna. A relocation plan for animals displaced by deforestation for the project is underway, he says. But it only considers large animals. “Nobody thinks of rescuing, for example, bats and these animals have significant biological importance for the environment,” he says. 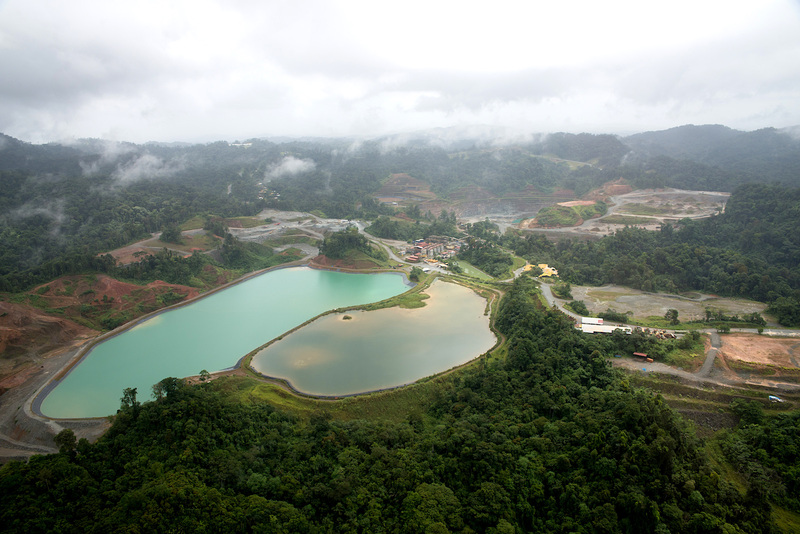 According to CIAM, this copper mine just another example of the “evident mismanagement” of mining projects in Panama, where they say authorities give precedence to profits over quality of life. This is a translated version of a story that was first published in Spanish on December 18, 2018. Cover image: Deforestation for mining inside the Mesoamerican Biological Corridor in Panama. Image courtesy of CIAM. Editor’s Note: This story was powered by Places to Watch, a Global Forest Watch (GFW) initiative designed to quickly identify concerning forest loss around the world and catalyze further investigation of these areas. Places to Watch draws on a combination of near-real-time satellite data, automated algorithms and field intelligence to identify new areas on a monthly basis. In partnership with Mongabay, GFW is supporting data-driven journalism by providing data and maps generated by Places to Watch. Mongabay maintains complete editorial independence over the stories reported using this data.